Happy Friday, folks. This week in real life, Brian invests in the Bose SoundLink after his pet rabbit destroyed his previous setup (no, really), while our own Andy Bowen explains why he'd rather use the DropCopy app than DropBox, much less AirDrop. And Darren, who racked up frequent flier miles this week traveling out to Google I/O, details the virtues of Worldmate over TripIt. Bunnies! Apps versus apps versus more apps. All that, just past the break. I have what is likely a fairly unique problem: a pet rabbit whose overwhelming sense of curiosity, ever-growing incisors and insatiable appetite for electronics wires rendered my last sound system useless. I've been in-between stereo gear since then, largely relying on a tiny pair of computer speakers for sound -- a less-than-adequate solution, even in a New York City apartment. The question, then, is how to fill the small (by non-NYC standards) space on a reasonable budget, while using this as an opportunity to cut cords in the process. The Bose SoundLink seemed an ideal solution, a standalone speaker that can be synced to multiple Bluetooth devices, and that's small enough to cart around. It's not particularly light, but it can fit in my messenger bag, and is a lot easier to pick up than a standard home stereo system. Granted, it's not quite as ritzy as a multiple-room system, but despite my love of music, I'm not really trying to impress anyone with my audio setup. 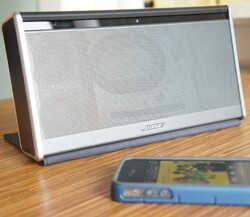 The Bose has big enough sound to fill the rooms of my apartment. It's a warm and full sound, and breathes a lot more life into those Thelonious Monk records than the computer speakers I've been relying on. The whole thing's pretty easy to set up, and being able to play Spotify tracks off of my iPhone the minute I get home is a nice bonus. I've run into a few syncing problems on occasion, but it's nothing that can't be remedied by holding down the Bluetooth button atop the speaker. Meanwhile, the range is good, but not great -- my dream of pushing music from my house into the back yard is often met with hiccups in the stream. Those minor issues aside, this thing has been an awesome addition to apartment living. Since I picked it up, not a day's gone by that I haven't used it -- and that includes recent trips to Boston and LA, when I kept the speaker stashed in my luggage. DropCopy has quickly made its way onto my top 10 favorite apps list. Part of that being because it cost me not one penny -- well, the lite version anyway -- but mostly because of its amazing usefulness. Back in 2011, I was wildly disappointed to discover that AirDrop seemingly wasn't making its way onto iOS devices. Actually, I may have been more confused than disappointed. I'd been waiting on a native app like that for the sole purpose of quickly sharing URLs and text files with my iPhone 4S. Unless iOS 6 really surprises us all, I'll probably stick with DropCopy for my data sharing needs. For one, it's generally much quicker than AirDrop. Yeah, I know, DropBox and SugarSync accomplish the same task, but it's much faster sharing a single URL or message with DropCopy rather than having to produce a text file and toss that sucker into the cloud. DropCopy's shining star? Speed, obviously. No dialogues, accounts or confirmations. It's an IP address, drag-and-drop straight shot. Ideally, I'd like DropCopy to chug along in the background (as it does on OS X). Manually launching the app every time I'm in need of a transfer? That gets annoying. I'd also welcome the ability to share those bits and bytes with my Macbook Pro courtesy of my data plan, and not be limited to a local WiFi network. Cloud apps definitely have the advantage here. Of course, thanks to Apple's third-party app regulations, internal files aren't accessible through DropCopy anyway, and vice versa -- you won't find an "export to DropCopy" option. There are a few ways to sort through the files that you're storing in DropCopy on your iOS device, but other than that there's really no organization at all. Just one folder with many, many files. A falling star perhaps? This app has a temperament: it's 100 percent dependable, 90 percent of the time. I've actually been using Worldmate for some time now, but I only upgraded to the Gold option recently -- right around the time it went on sale in the App Store for $2.99 (it's usually $9.99). Unlike so many other travel / itinerary managers, this one requires no yearly subscription. You pay once, and it'll work magic on whatever trips you have coming up. For one, I love that Worldmate Gold works on Android, iOS and the web, and it's relatively easy to make edits to trips on any of those platforms. It's also a super-polished app, and the ability to export minute details (things like multiple flight confirmation numbers for the Mr. and Mrs.) to my Google Calendar with minimal effort is a huge boon. 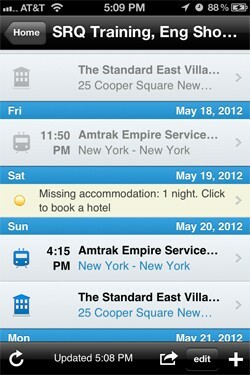 For those who aren't familiar with the app, it's designed to digest travel information via email. Just shoot over any email with confirmation details (a flight, car rental, hotel booking, etc.) and it'll update your trip and any connected calendars. The Gold edition also keeps tabs on your upcoming flights, alerting you to gate changes, time changes and the like as they're reported -- push notifications here work excellently, except when information isn't delivered to Worldmate from the airlines fast enough. Granted, that's not a Worldmate problem. Overall, it's remarkably useful for keeping tabs on a schedule that involves well over 80 flights per year (read: mine). But, I do have a few bones to pick. For one, it didn't recognize legitimate Delta flight information for a flight that was 9.5 months out (but flights happening within the next six months were added sans fuss). Two, it rarely understands atypical emails. For example, your casual email conversation about a Homeaway.com rental will probably confuse Worldmate's processing engine, again forcing a manual entry. 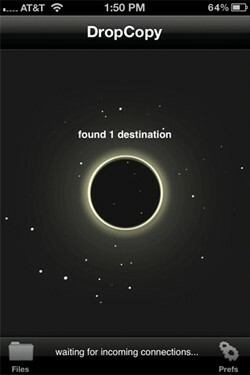 And lastly, it requires you to forward each piece of your trip to "trips@worldmate.com." TripIt, in contrast, simply looks in your inbox for you and makes updates as new email confirmations arrive -- that's way, way slicker. Of course, TripIt requires a $49 annual subscription for most of its niceties, so for $2.99, I'm more than willing to forgive Worldmate Gold's minor shortcomings.